Do your drink coasters (even ceramic kinds) have set-in stains due to constant use? You can easily remove those stains with a small piece of dampened Magic Eraser. Magic Eraser makes cleaning children’s items a snap. Easily clean stains on booster seats, high chairs, plastic toys, plastic figures, plastic balls, even dolls faces with a small piece of dampened eraser. Large plastic coolers often get impossible stains to clean out. The magic eraser works almost effortlessly to remove these stains – even ones that have been set in for awhile. What used to be another tricky mess to clean is now a piece of cake with Magic Eraser! Crayon marks and fingerprints on finished walls can now easily be removed in seconds with your damp eraser. Have some dried paint on your door hinges? No problem – a couple of swipes with the eraser cleans it in seconds. I have to admit this is by far my favorite use of Magic Eraser. I have a dry erase calendar on my refrigerator that I update every month and nothing I used was ever able to get it clean as quickly or easily as Magic Eraser. You know how tricky it can be to clean the little nooks and crannies in the spindle of an electric can opener, but a small piece of Magic Eraser squeezes in easily and cleans any dirt and grime quickly. Do you know that adhesive left behind by stickers, labels and price tags that are almost impossible to get rid of? Not anymore, a small piece of dampened eraser removes the adhesive in seconds. The Magic Eraser Kitchen Scrubber is specifically designed to clean greasy messes on your stove, countertops and even backsplashes. Another almost impossible stain to get out is hair dye from bathroom counter tops. While it might take a few applications, magic eraser works wonders at removing hair dye stains. Don’t spend tons of time trying to clean spatters in your microwave with a sponge, Magic Eraser works much quicker and easier. Not only can Magic Eraser help clean mirrors in your home or car, but also will keep them from fogging in the future. Magic Eraser cleans mold and mildew from plastic items in a matter of minutes. The Magic Eraser works wonders for cleaning stains from the top, front, bottom and sides of plastic garbage pails. No more scrubbing your pool liner with heavy brushes that risk tearing the liner, a Larger chunk of Magic Eraser cleans it gently and quickly. 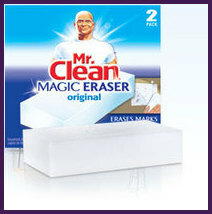 Easily clean up old food stains, rust stains and even mildew in your refrigerator with a dampened Magic Eraser sponge. As most of us know, it is a pain to clean resin or plastic outdoor furniture that has sat outdoors all winter. A dampened Magic Eraser will have your resin furniture looking like new in minutes. Another tough stain to usually remove are rust stains around pipes in your kitchen or bathroom. The eraser makes quick work of this as well. Finally a quick and easy way to remove scuff marks from floors! Simply dampen your Magic Eraser and gently rub away. Easily clean soap scum from tubs, shower and shower doors with a dampened piece of a Magic Eraser. Magic Eraser also works well for removing soot that surrounds a fireplace or range hood over stove. No need for messy sneaker dyes any longer; Magic Eraser also works well at getting white sneakers and tennis shoes looking great again! Leave a small piece of magic Eraser in your toilet bowl overnight for self cleaning of water rings – or if in a hurry – just swipe it over rings to clean instantly. Magic Eraser easily helps remove stains and marks caused by things such as green moss stains on both your vinyl siding and gutters. No need to remove your window screens for cleaning, simply use the magic eraser on them followed by clean water afterwards. Easily removes the grease, dirt and grime.